Now wouldn't it be cool to try a self camera view on your Apple iPhone or iPad camera using the above code? 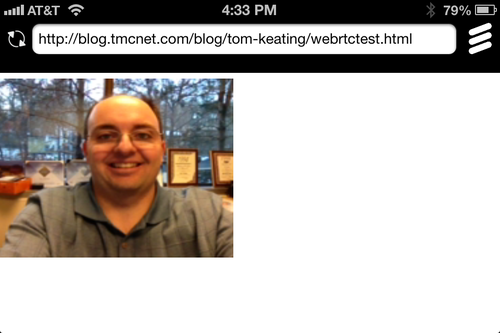 Alas, iOS Safari doesn't support WebRTC (yet). Ah, but the Ericsson folks released a WebRTC browser for iOS that you can download from the App Store here. It may not look like much since this is a static photo, but trust me, you will see live video within your Bowser browser coming from your Apple's camera. Is that cool or what? It isn't a stretch to see this as an Apple FaceTime or Microsoft / Skype killer. 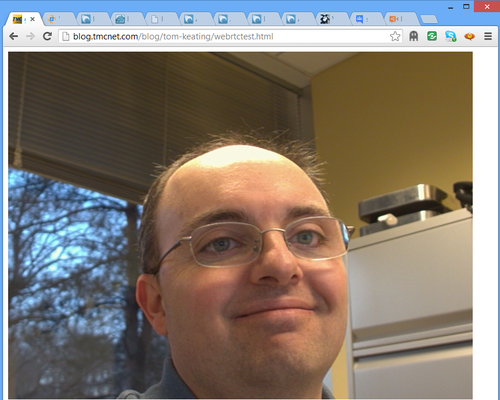 Ok, enough "self view" camera action - you want to demo two-way video using WebRTC, don't you? Well, head on over to https://apprtc.appspot.com/ from two WebRTC browsers that have cameras. Actually, you'll head to https://apprtc.appspot.com/ one time and the site will generate a random ID, like this: https://apprtc.appspot.com/?r=24771704 You will then use this URL for the second browser to join the conference. Currently, this demo only supports 2-party conferencing, but still a nice demonstration. I like how Browser Meeting simply asks you to create a unique "room name", which can be your own name of course, making it very easy for others to join your meeting room. One final example of WebRTC I'll give comes from Plivo, who built an open bridge that's basically a Proof of Concept for WebRTC letting people make their first WebRTC call. You can try it yourself here: http://webrtc.plivo.com/ You and a friend can both join and talk to each other via WebRTC to check out the sound quality, connection speeds, etc. Other people may be on too since it's just a big open bridge right now, similar to a party line. You should also check out bistri and twelephone. bistri is pretty interesting because it lets you link with Facebook, Google, Windows Live, Yahoo, Jabber/XMPP, and Вконтакте. It'll pull all your contacts and their presence status and display it on their website allowing you to chat, or make a voice or video call. twelephone is similar to bistri, except it uses Twitter for authentication. Hope you enjoy these WebRTC demos -- and production WebRTC solutions! Be sure to check out the WebRTC Conference & Expo which will be in Atlanta, George in June. 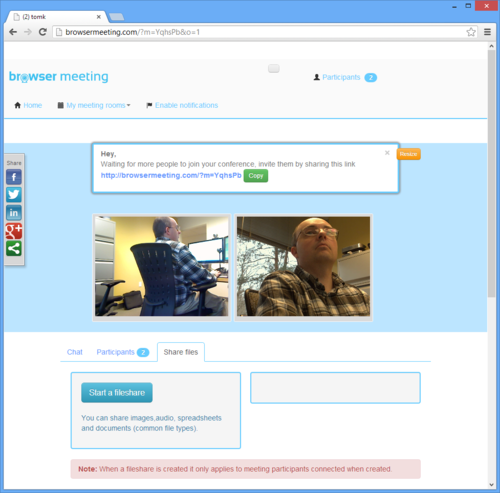 Also check out Veckon, which offers multi-party WebRTC conferencing. It generates a unique URL per conference. If you want to see CSS filter effects (X-Ray, B&W, Sepia, Blur, Hulk Green, etc.) applied to a WebRTC live camera, head over here.